Don’t forget our April Shoe Drive. 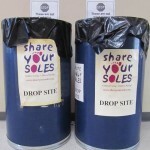 We are working in cooperation with the Share Your Soles Foundation. Our goal is to raise at least 1000 pairs of gently used or new shoes for those in dire need across the globe. For more information check this out: April Shoe Drive.